The 23rd Olympic Winter Games officially kicked off in Pyeongchang, South Korea, today with a dazzling spectacle featuring a parade of participating nations and a whimsical storyline. 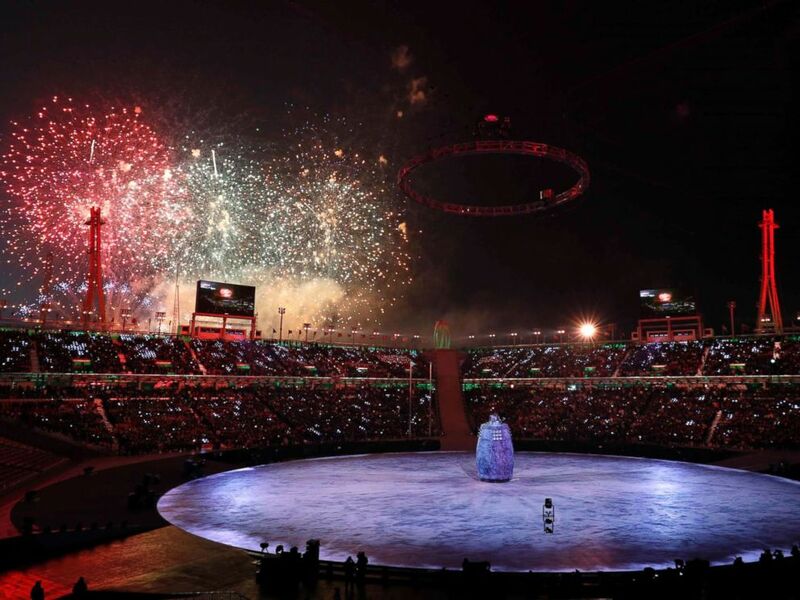 Although competition for the 2018 Winter Olympics began Thursday, the much-anticipated opening ceremony started today at 8 p.m. local time (6 a.m. ET), at the Pyeongchang Olympic Stadium in the normally-sleepy mountain town of Hoenggye, located in the Gangwon province of Pyeongchang County. To fend off bitter cold and high winds in the area, spectators at the 35,000-seat temporary venue were provided with gear such as a raincoat, blanket and knitted hats as well as hand, feet and seat warmers. 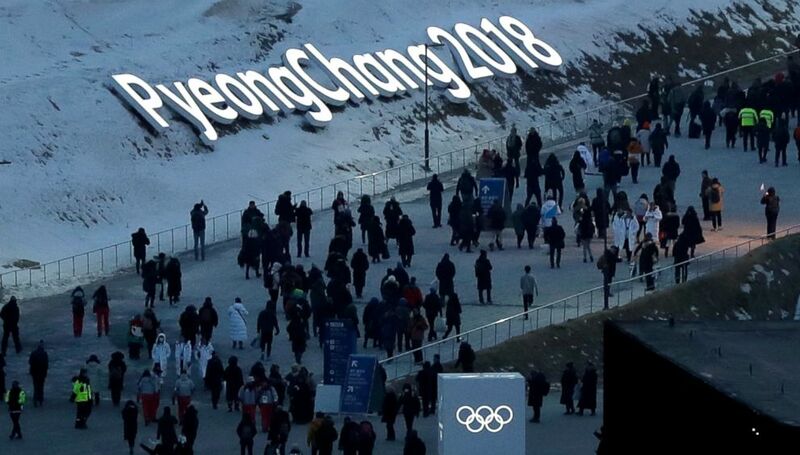 South Korea’s state weather agency reported temperatures during the opening ceremony that reached 27 degrees Fahrenheit, with a wind chill below 16 degrees Fahrenheit. Despite the cold, the audience appeared awed by the spectacle of 20,000 fireworks set off throughout the show, with some soaring nearly a mile high. The opening ceremony, titled “Peace in Motion,” emphasized its theme of peace by following the fairy-tale adventures of five imaginary children from Gangwon province with a cast of hundreds of other performers. 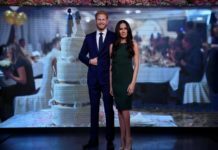 The magical journey was performed in parts throughout the ceremony. 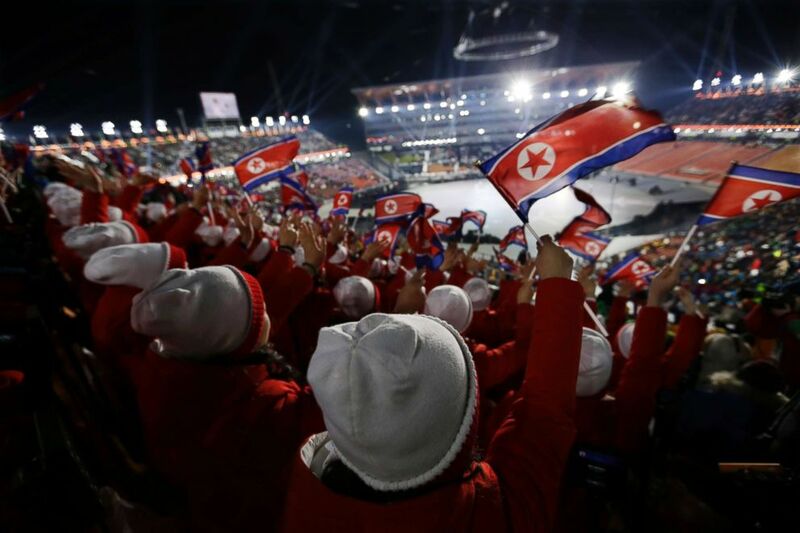 Members of the North Korean delegation wave flags as they wait for the Opening ceremonies to begin for the 2018 Winter Olympics in Pyeongchang, South Korea, Feb. 9, 2018. The storyline’s five children — Haenaroe, Ara, Puri, Bichae and Nuri — travel through time to the past and future, learning about South Korea’s history and culture. In the mythic world that the children explore, they first see a land of peace where nature and people live in harmony. When the children enter the future world, where everyone and everything are connected, they realize the importance of working together for peace. The children return to the present world as their journey comes to an end. They hold lit candles, passing the candlelight to a family who then shares it with other performers onstage. About 1,000 residents of Gangwon province with lit candles came onstage to help form the glowing shape of a dove. An additional 35,000 people in the audience also held candles. PHOTO:The five children perform during the Opening Ceremony of the 2018 Olympic Games, Pyeongchang, South Korea,Feb.9, 2018. When the stage was illuminated with candlelight, four South Korean singers began singing John Lennon’s “Imagine” as videos of 27 street musicians around the world singing the song were played. The five children then released a faux dove, a symbol of peace, into the night sky. The Rainbow Choir, a multicultural group of 75 children, sang South Korea’s national anthem as the host country’s flag was hoisted into the air. 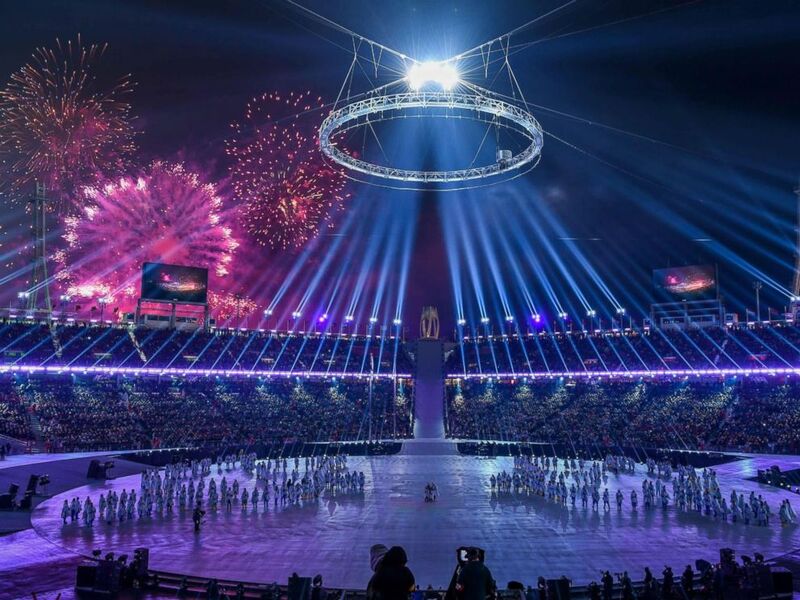 The athletes of the 2018 Winter Olympics marched into the Pyeongchang Olympic Stadium amid roaring applause and cheers. Erin Hamlin, the first U.S. athlete to win an Olympic medal in singles luge, was Team USA’s flag bearer at the opening ceremony. 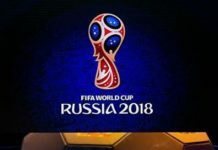 North and South Korea were last to enter the stadium. The teams marched together behind a “unification flag” carried by an athlete from each country, according to the International Olympic Committee. Fireworks light up the night sky as the Opening Ceremonies for the 2018 Winter Olympics begin in Pyeongchang, South Korea, Feb. 9, 2018. Russia’s national Olympic committee was barred from the 2018 Winter Olympics as punishment for its alleged state-sponsored coverup of doping by its athletes. 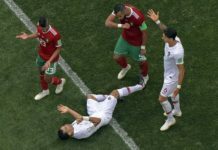 But some individual Russian athletes will be allowed to participate in the games by competing under a neutral Olympic flag. People arrive at the Olympic Stadium for the opening ceremonies of the 2018 Winter Olympics in Pyeongchang, South Korea, Feb. 9, 2018. Eight South Korean athletes of winter sports carried the Olympic flag into the Pyeongchang Olympic Stadium, where it was hoisted and South Korean opera singer Sumi Hwang sung the Olympic anthem. The Olympic Winter Games Pyeongchang 2018 Torch Relay arrived at its final destination at Olympic Stadium during the opening ceremony. The final torchbearers jogged up dozens of stairs to light the cauldron with the Olympic flame. The 27.5-inch torch represents the altitude of Pyeongchang, which is nearly half a mile above sea level. Its white and gold tones are the main colors of the 2018 Winter Olympics Torch Relay. The torch was designed by South Korean artist Kim Young-se and is intended to stay lit in various weather conditions, even against South Korea’s strong winds and heavy snow. PHOTO:The Olympic flag surrounded by flags from various countries that are competing in the Winter Olympics, wave in the wind in front of the Olympic Stadium in Pyeongchang, South Korea, Feb. 7, 2018. South Korean actor and producer Song Seung-whan was the executive creative director of the opening ceremony. The Pyeongchang Olympic Stadium will also host the closing ceremony for the 2018 Winter Olympics Feb. 25. 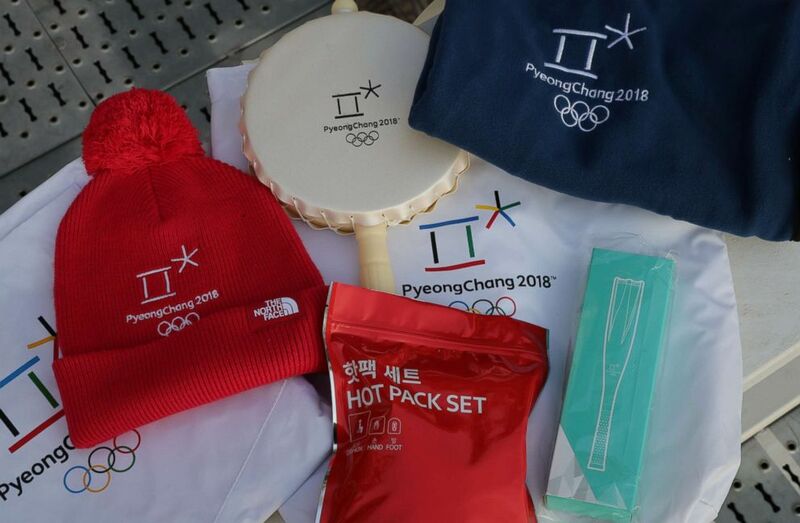 A package consisting of a hand warmer, a heat cushion, a wind cape, a small drum and a cap will be handed out to the audience at the opening ceremony of the Winter Olympics Feb. 9, 2018. 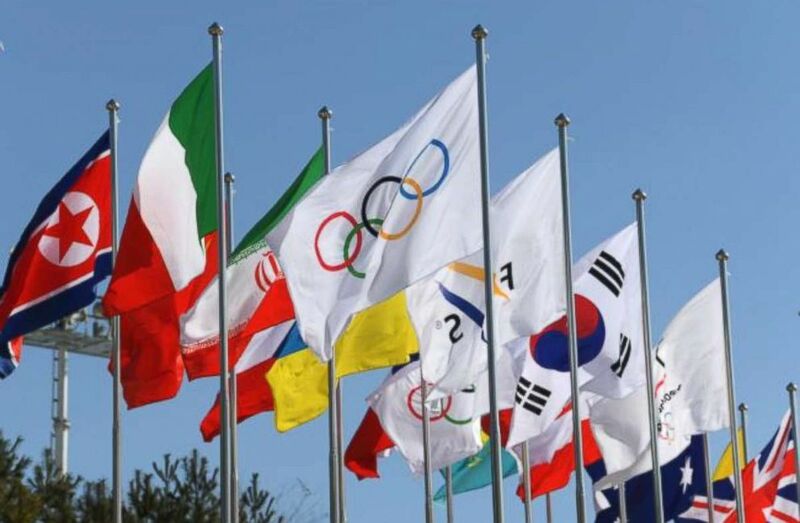 This is the second Olympics held in South Korea; Seoul was the host city for the Summer Olympics in 1988. “Now is the time for Pyeongchang,” he said. ABC News’ Clark Bentson contributed to this report.